Raised Foil Available on One or Two Sides Ontop of Our Thick 16pt Card Stock with a Soft Velvet Laminated Finish. Printed on 16pt card stock and then laminated with a 1.5mil scuff resistant, soft velvet laminate and finished off with one or two sided raised foil. Available in increments of 250 and 500. Raised Foil Business Cards are now available. Printed in full color on our Heavy 16pt Card stock and Laminated with a Soft Velvet Lamination. The foil literally jumps off the card with this raised effect. 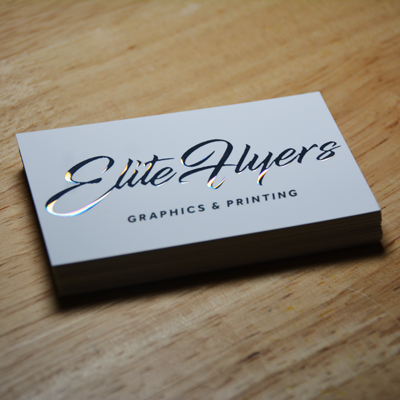 You can feel the texture when running your fingers over the business cards. Unique with foil, the soft feel of the card is certain to make a great impression! Available with one or two sided raised foil. If you want to represent luxury, then these are the cards for you. Unlike standard foil. Raised foil has a depth of .05 millimeters (50 microns). Raised Foil projects are set up the same way you would set up a standard foil stamped project. When submitting a Raised Foil Stamped order, you must include a Foil mask file along with the regular print file. The Foil Mask file will indicate where the Raised Foil will be applied. For better quality, we recommend creating mask files in vector-based programs such as adobe Illustrator. Please only use a solid 100% K to indicate where you would like the Raised Foil to be applied. Do not use shadows, glows or grayscale images. White = No Foil.